I am on the constant quest to find the *perfect* under eye concealer. I have terrible dark circles due to my fair skin tone (thin skin? ), allergies, heredity, and general lack of sleep (I have to get up *so* early for work). I mean; seriously, without makeup, I look like I have black eyes! I really never leave the house without at least some under eye concealer. Since there is no "miracle cure" for dark circles (although, I sure do try a LOT of eye creams and treatments with hope that something will help), I focus my efforts on finding the best concealer possible. Most concealers on the mass market just don't provide enough coverage for my dark circles; and, generally drugstore concealers are too dark for my ultra-pale skin. I need to whip out the "big guns" for my uber-dark circles! I find that I rotate concealers depending on how much coverage I need on certain days (and how much time I have to get ready in the morning). Sometimes my dark circles are less apparent (when I am getting more sleep and allergies are not being bothered). So far, here are my front runners (and I do apologize that some are discontinued! So, please help me in my search for more alternatives): Also, note: I listed the colors I use, for very fair skin (for reference, I am a NC 15 in MAC). 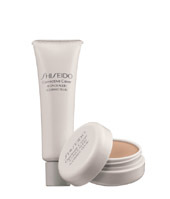 Sheseido Optimal Cover Concealer in C2 Beige Yellow: This one is the best! But, unfortunately discontinued. It is amazing. This product comes in a little jar and is HIGHLY pigmented. A very very TINY amount provides FULL coverage, blends well, and lasts all day without any caking. Also, the color is ideal for dark circles...it is a peach/yellow color that completely neutralizes under-eye darkness. I do not apply this to the whole under eye area...just the areas that are the darkest. So, I layer this over other more sheer concealers (like MAX factor Erase stick in Fair). So, I consider this a 2-step concealer. I believe the testure of this would be too heavy over the whole eye area. But, for those super dark areas...perfect! It took awhile to get the hang of application. If you put too much, it is way too cakey. The key is to apply a SMALL amount. A little goes a LONG way. This was my HG ("Holy Grail") until I found that it was discontinued. I have had my little pot of this product for a long time, and it will likely last for years (I know...I am sure it will eventually go bad, but the product is still working just fine and has shown no signs of "going bad"...I always check it for signs that I need to toss it). If anyone from Shesideo reads this...please bring back this concealer!!! 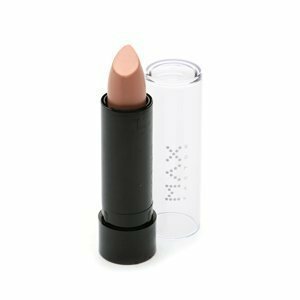 NARS stick concealer in Vanilla: This is one that I have repurchased about 5 times. I wish the color was just slightly more peach and the texture just sightly more creamy. But, it does work very well. It is quick and easy to apply this product. And, gives coverage in just one step. Very buildable. Good color for my fair skin. Will likely repurchase yet again. I have also noticed that this concealer wears VERY well in the heat...no melting. Totally covers my circles. MAX Factor Erase stick in Fair: I love this one as it is VERY inexpensive and gives nice (but more sheer that the ones listed above) coverage. The color is slightly peach-ish which works well to counteract the dark circles. I use this when I need lighter coverage...OR when I have time to do my 2-step coverage with this all around the eye and the Shesido just in the super-dark areas. *While adding links to this blog post...I am very happy to discover that Amazon.com sells this concealer!!! YAY!!!!!!!!!! Edit: One of my readers told me this one is no longer sold in US, Europe only; BUT, it is available online (and inexpensive) at Amazon.com and drugstore.com. 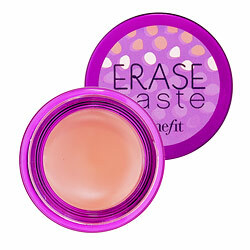 Benefit Erase Paste: Fair: This is one of my fav "new" concealers that I am trying. So, far...I love it!!! It is a great one-step concealer. I use it in the fair color. As always with BeneFit, it comes very cutely packaged in a little purple jar. This concealer is specifically formulated for the under eye area. It is extremely moist and blendable. Very easy to apply and spread/blend with a concealer brush. It really just melts into your skin. No need to worry about this one settling into any fine lines...the product is so moist. But, you definitely need a setting powder with this otherwise it will not last all day. Coverage is buildable so you can really apply more to those super dark areas. Overall a winner! You get a ton of product so this will last me a LONG time. 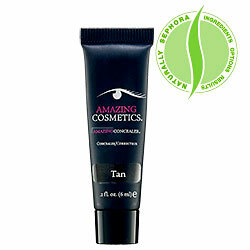 Amazing cosmetics Amazing concealer in Fair: This one I just recently purchased and have been trying out. It comes in a squeeze tube and is HIGHLY pigmented (the high pigmentation reminds me somewhat of the Sheseido). You only need a very tiny amount for full coverage. Takes some practice to get the application just right (too much would be cakey). With the full coverage, you do sacrifice some spreadability. Therefore, I really recommend using a silicone based primer or silicone based eye cream before applying this product. The silicons will help this blend/melt into your skin. So, that really makes this a 2-step concealer. Very promising as a future HG for me...especially on those days that I really need the heavy coverage. This is for sure the concealer (non-discontinued) that I am the most excited about! blend out with fingers or cosmetic "wedge" sponge. You dont want your concealer to look cakey and obvious. Blend so it becomes "one" with your skin. Concealers I use for other areas of the face: (just a little bit around my nose area where it can get slightly red): Maybelline Mineral Power concealer in Fair or Bobbi Brown Stick foundation in Porcelain: and FYI: when I am in a hurry I use the Bobbi Brown stick under my eyes too...but, it wont completely cover the circles, but will do in a pinch). I keep the Bobbi Brown Stick in my purse for any touch ups that I might need during the day. What concealors do you all like? Would love to hear what is working for everyone. Especially those with dark circles. I know that my best friend swears by Dermablend Smooth Indulgence (which I imagine is similar to the Amazing Cosmetics as they are both highly pigmented and in a squeeze tube). 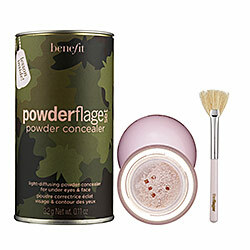 -BeneFit "review-a-thon"...have quite a few products from this line that I will be reviewing...starting with the Powderflage that I mentioned in this post. Thanks girly! I can't wait to try out some of these tips. The reason you can't find Max Factor near you is because they no longer sell in the U.S. You can still purchase them through drugstore.com- they now only sell in Europe. Ah-ha! Thanks, good to know that I can reorder when I run out...I am almost out of the MAX factor. Too bad they no longer sell in the US! Hi Ms Nancy, thanks for stopping by my blog! I enjoy reading yours. :) I think that the Bobbi Brown Stick Foundation would work nice over light scarring and for more major scars possibly the Amazing Cosmetics Amazing concealor (the pigmentation is so concentrated) or the Dermablend Quick-Fix stick. The Dermablend stick is very thick (and slightly hard to spread)...it might work best if you "warm" the concealor on your hand with a brush and then apply (to help it spread better). These are just my best guesses as I have not used them on acne scarring; but, have used the Dermablend stick to cover some surgical scarring. :) Hope that is helpful! i'm in Love with the new Mac's concealer: the Prolongweare!It's amazing! It covers perfectly by bad bad dark circle,it mosturises my skin without making it Oily,It's easy to Blend,it's my best friend right Now!!! Thanks for recommending the MAC pro long wear! I *heart* MAC and need to pick that up next time I hit the MAC counter! Thanks for sharing a tip!!!! Hi! Thanks for the review! I also have very dark undereye-circles. What I find helps enhance any concealer is a primer! I just bought L'oréal Studio Secrets "Professional Smoothing Resurfacing Primer" and apply a little bit to the under-eye area after the moisturizer is set, before I apply my concealer. And it really helps preventing the concealer from setting into the fine lines and makes it stay longer and you get better results! Hi Nanna-thanks for your comment...and yes, I agree about how much a primer can help! I will have to check out that L'Oreal Studio Secrets...I know I have a coupon for it laying around somewhere. :) Glad to hear that is working for you! Oh, I must try Erase Paste someday! I love the NARS one too. My skin is light but a bit darker than yours, my color in Honey. I LOVE Make Up Store Cover all mix! But unfortunately I can't use it at wintertime, it's too drying... But it is PIGMENTED. I recommend to apply this product with MAC blending brush (217). @Candy Apples-thanks so much for the comment! I hear ya girl, so much of the dark circle issue is hereditary...that plus lack of sleep =terrible circles. I am on the constant quest for a solution. These listed above are the best I have found, but I am always open to finding more solutions!!! I am about to test the Pixi corrector...stay tuned for more reviews. In the meantime, those that I have posted above are still my best picks. :) thanks for reading! thanks for sharing! ^_^ im using maybelline. I thought I was the only one with an obsession with concealers...love to see someone else does too : ) Thanks for sharing what you have, some new ones for me to look at. -just bought the concealer palette from E.L.F but haven't tried it yet. Thanks Again for your list. Thanks for all the great tips!! I have bad dark undereyes too, so I will have to try one of these concealers. I'm thinking the Nars or Benefit. Hi Val! Thanks for the follow! :) Yes, both those work great as does the Amazing concealer! :) Pixi has a good one too! I am *always* on the search for good concealers. 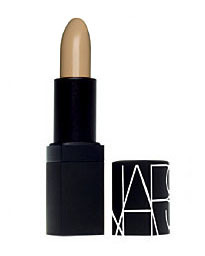 The NARS is one that I always come back to! This is really helpful! I keep having the issue of my concealer settling into the fine lines under my eyes. Awesome post, I like Amazing cosmetics Amazing concealer most for all the ones you mentioned.